To begin with, we must clarify that so-called “NSBM” is nothing more than a simple, melody-driven black metal of short and repetitive phrases usually played with power chords. The characteristic structures are also cyclic and concentrate on etching the impression of the melodies pathos on the mind of the listener, while the voice contrasts this yet is supported by the aggression of the playing and the heaviness of the drums. Percussion is intense, but not in the sense of loudness or complexity, but rather the comparative effect they have within the music, and it is from this relative significance attained by context that they become properly ‘heavy’. The very limitations that entrap crossover thrash or grindcore, also enclose this illusory mini-style of black metal. What Kristallnacht compiles in Blooddrenched Memorial encompasses the best that we would be able to find anywhere in the genre. We must again allude to Fanisk as an exception, because their style differs from the norm of what has musically fitted into “NSBM,” escaping its clutches by a far more developed sense of melody and composition —as seen in their underground “masterpiece” Noontide (2003). Musically, there is a tendency to lump the black metal miniaturization of Kristallnacht with Oi! and RAC. In truth, these belong to distinct musical genres, and as such, mixtures fall into one or other genre (with Infamous falling on the black metal side). 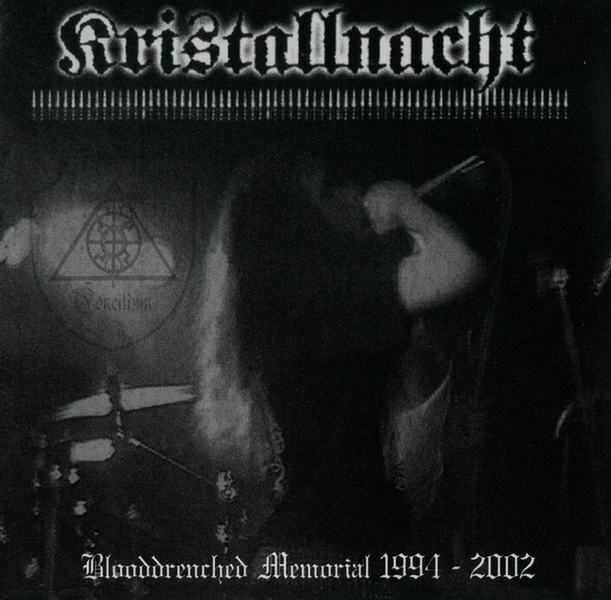 Kristallnacht itself stands completely on the talent of the artist, and these are veritable folk-like songs played in the style of black metal. The band’s great feat is to have remained black metal through and through, not only in instrumentation but in the details of techniques and melodic orientation. Whereas many other “NSBM” bands are crippled by folky guitar mannerisms, Kristallnacht channels a transformed aggression from the unadultered hate-and-destruction releases such as Uranium 235 Total Annihilation (1995). Independently of whether its views are favored or not, the listening experience is satisfying —while not overwhelming— if a sense of stupor and vague melancholy is sought by idealistic outsiders. By virtue of its origins and realization, it can never arise to the occassion as battle-inspiring music, and even less so as a transcendental transportation of the soul. funny, you tout them as “one of the few worthy nsbm bands” when they’re exactly my idea of “crappy generic NSBM.” The thing about 2nd wave black metal is so many of them drink from the same stream, you can find “depth” even in the clones. Aside from Poland and Germany (oblig. ), I’d say Russia’s got the best NSBM. Stuff like Nitberg–skaldic and folky, but in a deeply felt, authentic way rather than the plastic ewok music of the Ukraine scene. If it would be really the best of the genre, it should be able to achieve that with ease. But it’s pretty mundane. I like the ideology, though. Lol @ dude calling Kristallnacht “generic crappy nsbm”. They set the standard if anything. All the Concilium bands were unique in their own way (Blessed in Sin, Seigneur Voland, Kristallnacht, etc. culminating with Desolation Triumphalis, which is probably my favorite and I consider the best of them all). This particular scene of French black metal is where Shatraug and other Finnish black metal dudes got the whole open string/single note, hyper-melodic riffing style and exaggerated Donald Duck vocals , which can be interpreted as bad as good. This isn’t speculation and this influence has been corroborated by people in that scene, namely Shatraug. Too cowardly to reply to my actual post so I see it? For the record, I have a soft spot for generic NSBM. Aryan Blood, Bilskirnir, all that stuff, it’s nice in a derivative way. But don’t trick yourself into thinking it’s on the level of early 90s BM.